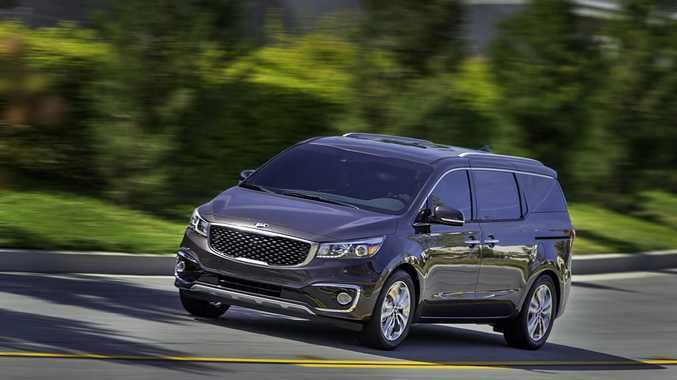 TOUGHER with a muscular appearance, the 2015 Kia Grand Carnival has been revealed ahead of its Australian arrival early next year. This is the last vehicle in Kia's line-up to receive an external overhaul. Designer Peter Schreyer has been instrumental in the brand's dramatically improved good looks, and the "pimped" people-mover is now no different. Helping to provide that brawnier appearance is a wheelbase which is about 40mm longer than the old model. Reduced front and rear overhangs, a deeply swept windscreen, along with optional 19-inch alloys, deliver a much more enticing Grand Carnival. Width and height remaining virtually unchanged, but Kia said there is extra front shoulder room, greater leg room in the front, second and third rows, as well as a slightly higher hip-point that improves outward visibility for the driver. While the vehicles on show in New York this week have the option of seven-seat configuration, Australian variants will only be available with eight pews. Also on show was a new 3.3-litre V6 engine which replaces the 3.5-litre V6 found in the previous generation Carnival. It's mated to a six-speed automatic transmission, and pumps out 205kW (at 6000rpm) of power and 336Nm (at 5200rpm) of torque. The carryover 2.2-litre diesel is also expected to be available. All new Carnival models come standard with active safety features such as Electronic Stability Control, Traction Control System, Brake Assist System, Hill-start Assist Control, Electronic Brake Force Distribution and Antilock Braking System, as well as Roll Over Mitigation and Cornering Brake Control. New optional driver technology, including Vehicle Stability Management , Forward Collision Warning System, Smart Cruise Control, Blind Spot Detection and Rear Cross Traffic Alert, is also expected to be available.